If you drive an F-53 Ford chassis RV you need to check the rear Stabilizer Bar (SB) attaching bolts on the differential. We are hearing and reading that an unusual number are finding out that the attaching bolts are loose or missing. When this happens sometimes the bracket is bent, broken and some damage is done to the attaching bolts and nuts. If the bracket is missing you will loose your SWAY control associated with the SB. The number of folks reporting this seems to be greater than normal. No serious damage or loss of steering control or handling will result but you will/may loose some of your SWAY control. Here is the recommended fix. Remove the bolts and add some blue lock tight. 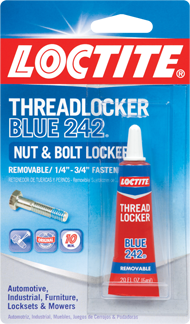 Blue lock tight will prevent the bolts from coming loose in the future but they can still be removed using the correct tools. Red lock tight is one step more and will require heat applied to the bolts so they can be removed. That is not necessary. All the attaching bolts are torqued to 66 ft lbs. That torque is true for all as far back as I can determine. We have not been hearing reports concerned with the front SB but I'd still perform the same fix as well. Better safe than sorry. If anyone needs further assistance please check on the CHF thread and send a PM to any of the frequent posters. When my coach was being aligned at the Fleetwood service center the techs there found the cap missing. The local Ford dealer took care of the repair. 2017 Thor Venetian, T42 "Groot"
I am sitting in a Ford dealership having the drivers side rear SB clamp replaced under warranty. Jim. Yep. It's a common problem. Had the issue on my '99 F-53. Had to buy new caps and poly bushings. Plan on keeping on eye on the new rig. Thanks for posting this up. Do you know what years are effected? Generally ALL years. My 2006 lost a driver side rear bracket. I lost one bolt on the drivers side and it caused the bracket to rotate down and the rubber bushing to slide a few inches down the sway bar. I noticed the coach handling very poorly and a scraping sound while making turns. Crawled under and found it. Quick trip to the hardware store and cranked on it as hard as I could and I havnt had a problem in over two years. Good info for all of us. Finally checked mine today, 3 of the 4 bolts where loose. One was quite a ways out but still threaded. Thanks TeJay for the Post. I did not add Locke tight just re-torqued. Question for you TeJay??? I know you are reading LOL. It did not look like the bushings had any lube, I plan on removing all the bolts after my labor day trip and added Locke tight then re-torque them all. You suggest replacing the poly bushings and lubing in the process or just lube my current ones ( they are a year or so old depending on when exactly my 2015 chassis was rolled off the line). Your opinion is greatly appreciated. !!!! or anyone else who reads this. 6 of 8 SB bolts were loose on mine, one so loose I could see threads under the head. The rest except for two were not up to required spec. Now all have blue locktite and proper torque. BTW ours is a 2014 (2013 chassis) with less than 10k miles. Yep, I was one that was impacted. Mine was gone altogether. Ford replaced under warranty. I have a 2015 and found one on the passenger side missing the other loose and both loose on the drivers side while on a trip in florida, straightened the bracket and replaced all four bolts with loctite, checked the front and they were ok.